Tellers Opus 972 (1966), two manuals and pedal, 28 stops, 25 ranks, un-enclosed, stopkey console, Philadelphia area. Hauptwerk, Positiv, and Pedal are mounted on ventil chests and are positioned on either side of the Choir Loft. The 16’ extension of the Trompette is divided across and standing directly adjacent to these chests. The remainder of the organ is positioned across the center of the loft area. The entire organ could be contained in a space of 175-200 Sq. Feet. This instrument was designed as a mid-20th century expression of an unenclosed, north German Baroque organ. The console is slim and absent of any frills, and in need of refurbishing. The pipework is in good condition and chests are acceptable. The keying and stop-control mechanics are in need of updating. This instrument is offered, as is, for $5,000.00 and the buyer must bear the cost of removal. Consultant and refurbishment services are available if desired. 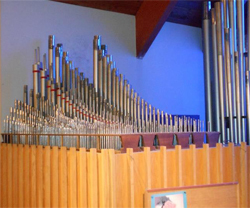 For more information or to make an appointment to audition this organ, please email Don McFarland – [email protected].